First, you need a soldering iron (around 25W), 60/40 solder and optionally a soldering iron holder. Note that you'll probably want one unless you're the careful type and you're sure you won't burn up anything. The soldering iron is extremely hot so DO NOT touch the metal parts of the soldering iron! Also, try not to breath the fumes from the solder. Work in a well ventilated area. Before you solder, you must tin the tip. Simply wait for the soldering iron to heat up, apply a coat of solder on the tip, and wipe it with a wet sponge. Now, to solder the components onto the board, cut the leads at the proper length. Stick the component's leads through the proper holes and bend it so that It'll stay still. Put the soldering iron tip so that it's touching the lead and the copper at the same time. Then apply the solder on the lead (not on the tip of the soldering iron). Let the joint cool by itself. PRACTICE A LOT! 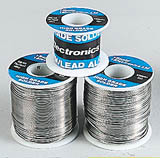 A small tip: Whenever you remove insulation from an end of the wire, apply a coat of solder to the exposed end. It will be much easier to handle after that. Please report any broken links!